London, Oct. 10, 2018 (GLOBE NEWSWIRE) -- EDTECHX HOLDINGS ACQUISITION CORP.
London, United Kingdom (October 10, 2018) – EdtechX Holdings Acquisition Corp. (NASDAQ: EDTXU) (the “Company”) announced today the closing of its initial public offering of 5,500,000 units at $10.00 per unit. Each unit consists of one share of common stock of the Company, par value $0.0001 per share (“Common Stock”), and one redeemable warrant (“Warrant”) entitling the holder to purchase one share of Common Stock at a price of $11.50 per share. 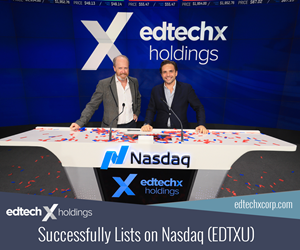 The units have been listed on the Nasdaq Capital Market (“Nasdaq”) and trade under the ticker symbol “EDTXU.” Once the securities comprising the units begin separate trading, the Common Stock and Warrants are expected to be traded on Nasdaq under the symbols “EDTX” and “EDTXW,” respectively. Of the proceeds received from the consummation of the initial public offering and a simultaneous private placement of warrants, $55,825,000 (or $10.15 per share of Common Stock sold in the offering) was placed in trust. An audited balance sheet of theCompany as of October 10, 2018 reflecting receipt of the proceeds upon consummation of the initial public offering and the private placement will be included as Exhibit 99.1 to a Current Report on Form 8-K to be filed by the Company with the Securities and Exchange Commission. EdtechX Holdings Acquisition Corp. is a blank check company organized for the purpose of effecting a business combination with one or more target businesses. EdtechX Holdings Acquisition Corp.’s efforts to identify a prospective target business will not be limited to a particular industry or geographic region, although it intends to focus its search for target businesses in the education, training and education technology industries. Chardan and I-Bankers Securities, Inc. acted as joint book-running managers of the offering. The Company has granted the underwriters a 45-day option to purchase up to an additional 825,000 units to cover over-allotments, if any. The offering was made only by means of a prospectus. A copy of the prospectus may be obtained from: Chardan Capital Markets, LLC, 17 State Street, Suite 1600, New York, New York 10004. Contact: Vim de Alwis: VDeAlwis@chardancm.com. This press release may contain forward-looking statements within the meaning of the federal securities laws. These forward-looking statements inherently involve risks and uncertainties that are detailed in the companies’ registration statements and other filings with the Securities and Exchange Commission and, therefore, actual results could differ materially from those projected in the forward-looking statements. The companies assume no obligation to update publicly or revise any forward-looking statements, whether as a result of new information, future events or otherwise.